The Langlands program predicts that for every n-dimensional Abelian variety over Q there is an automorphic representation of GSpin(2n+1) over Q whose L-function coincides with the L-function coming from the Galois representation on the Tate module of the Abelian variety. Recently, Gross has refined this prediction by identifying specific properties that one should find in a vector in the automorphic representation. In joint work with Lassina Dembele, we have found some examples of automorphic representations of GSpin(2n+1) over Q whose L-functions match those coming from certain n-dimensional Abelian varieties over Q, all built from certain Hilbert modular forms. We are in the process of checking if these examples contain vectors with the properties predicted by Gross. 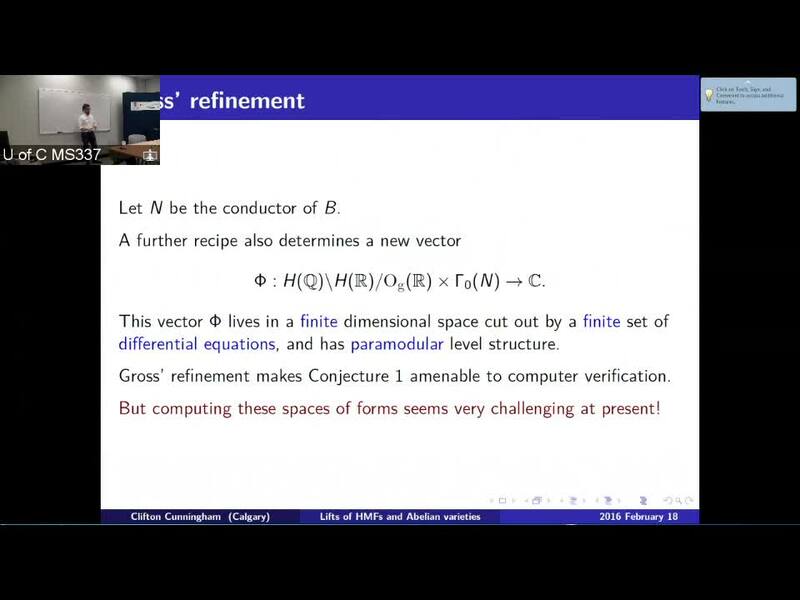 In this talk I will explain the lifting procedure we are using to manufacture GSpin automorphic representations and describe the examples we are focusing on as we hunt for the predicted vectors in the representation space.